In anticipation of Apple's own mapping announcements, Google Maps issues a slew of updates. Will it be enough to quell any Apple Maps excitement? The feature we all knew was coming, a much-improved 3D interface for Google Earth, was officially announced today (you think you’re so sly with that “next dimension” reference, don’t you Google?). 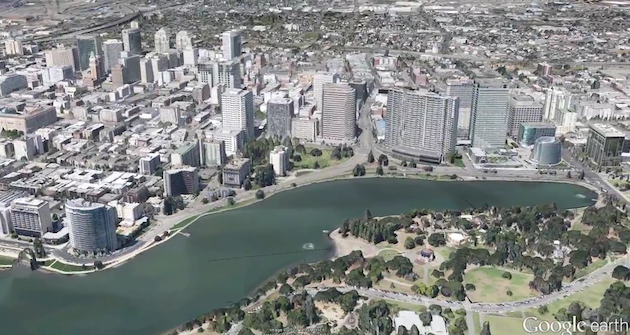 All that 3D goodness will now be baked into Google Earth for metropolitan areas. Google plans to expand this coverage quickly as well. Google used fly-over footage to capture 45-degree aerial imagery for this new feature – which gives the effect of Street View plus 3D plus subtle animation. Google also showed off a feature called Tour Guide, which lets you use its new 3D tools to explore the available cities. The new capabilities will hit iOS and Android within the coming weeks. Overhead 3D images they are not, but the Street View technology is stretching its reach. Google is launching the Street View Trekker, taking its camera and going where wheels cannot. It’s a backpack-camera combo that will capture terrain Google previously hasn’t had access to – think hiking trails and walking paths. Android users, rejoice: you’re getting offline support with the new Google Maps. The ability to find directions even when you don’t have a data connection has been one of the more requested features for mapping clients since… since people started using Google Maps on their smartphones. Imagine the various times you’ve been stranded, connection-less, and all you wanted was a cached version of your directions. Well, Android users, you’re in luck. Google wants to bring this to all platforms, but for the time being, it’s Android-only. You can’t help but assume that this capability is something Apple isn’t allowing Google to throw into the iOS app just yet — either because Apple plans to offer the same function in its forthcoming client and doesn’t want to give Google first dibs or because it’s not, and doesn’t want that to be a tipping point for users. That’s the resounding question following today’s press conference. Is this the preemptive strike Google needed to issue before Apple announces its own answer? Obviously only time will tell and it’s possible that Apple would come barreling out of the gate with an extremely competitive product. But my money’s on Google: with such an infinite amount of data (ever-changing, data as well), veteran status and long-standing resources matter. The largest hurdle Google will face in this is that native app placement is a big deal, and iPhone users could easily defer to whatever Apple’s allegedly about to throw on their homescreens. I think familiarity and a unified user experience (if you use Google Maps on the desktop, won’t you want to use it on your phone?) coupled with all of Google continuing efforts will be enough to keep it a frontrunner.